In the middle of my undergraduate studies at uni I got thoroughly sick of the whole thing. It got to the stage where I couldn’t bring myself to even look at my physics and maths textbooks, let alone open them and do the work. It was time, I decided, for an emergency holiday. I used the money I’d saved from summer jobs driving cranes and forklifts and went backpacking around Europe for a semester. On that trip I discovered, totally by accident, a little town called Hay-on-Wye on the border between England and Wales. Famous to pretty much everyone but myself at the time, the town is known for its huge annual literary festival, and its 40-odd bookshops crammed into the one tiny village. I decided to go looking for a second-hand copy of either Raymond Queneau’s 10 Thousand Billion Poems (or whatever the number is) or the Codex Seraphinianus. I found neither. 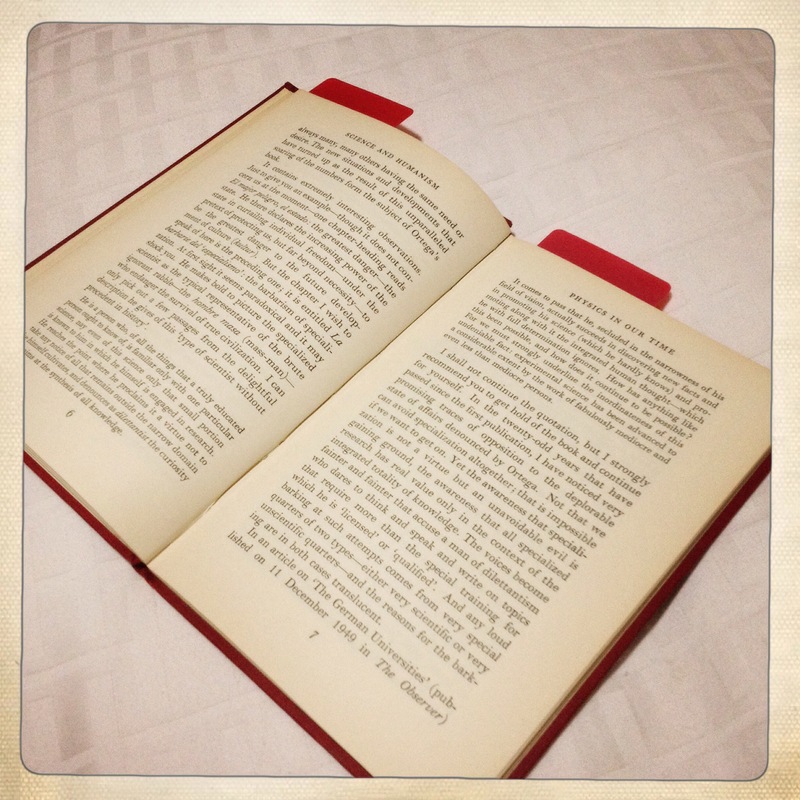 The one book I did buy was a skinny, uninteresting-looking red volume for two-pounds-fifty. It was ‘Science and Humanism’ by Erwin Schrödinger, supreme overlord of quantum mechanics and notorious metaphorical cat-boxer-upper. I think I read it on the Orient Express somewhere in Austria. Later, I read it in a riverside park in Morpeth. I’ve just re-read it here in Port Macquarie. There are bits in this book that have a similar effect on me as the Sermon on the Mount. (I shall explain later.) I have included some of these quotes in at least a dozen public talks I have given. Probably more. I’ll tell you a bit about what’s in the book, then tell you why I can’t stop talking about it in public. This tiny, 67-page book contains material from four public lectures Schrödinger gave in 1950 for the Dublin Institute for Advanced Studies at University College Dublin. In it, Schrödinger addresses the following questions: What is the value of scientific research? How has quantum mechanics changed our views of the nature of matter? and Does quantum mechanics give free will a chance? 1. What is the value of scientific research? In the opening 11 pages Schrödinger makes a succinct point about something I’ve been thinking a lot about recently – the nature and value of science. Has the promotion of knowledge within a narrow domain any value in itself? Has the sum total of achievements in all the several branches of one science – say of physics, or chemistry, or botany, or zoology – any value in itself – or perhaps the sum total of the achievements of all the sciences together – and what value has it? His answer is that science’s value is the same as that of other fields of learning – it’s an endeavour, as he says beautifully in the quotation atop this post, that aims to do what all our other fields of study do: it tries to discover more about who we are and what this place is in which we live. Consider the study or research in history or languages, philosophy, geography – or history of music, painting, sculpture, architecture – or in archaeology and pre-history; nobody would like to associate with these activities, as their principal aim, the practical improvement of the conditions of human society, although improvement does result from them quite frequently. I cannot see that science has, in this respect, a different standing. Incidentally, the first time I heard someone say this was Margaret Wertheim when she was a guest on a Roy and H.G. show on Australian TV. She said, as a scientist and science writer, that she didn’t believe there was any justification for spending billions on the Large Hadron Collider while cutting funding to the arts. As a young physics student, I was scandalised; the audience however applauded. I consider it extremely doubtful whether the happiness of the human race has been enhanced by the technical and industrial developments that followed in the wake of rapidly progressing natural science. He cites the potential for nuclear winter as an extreme case, and the case of modern transport as a more benign one. It’s easier to travel nowadays, he says, but it’s still expensive, so that families get spread across the globe but aren’t rich enough to meet again. Has this increased their happiness? So while I reserve my judgement about whether technology has made our lives better overall, I do firmly agree with Schrödinger that if it has, it’s because of non-scientific things like ethics and governance (yes) and philosophy, and not because of anything intrinsically good in science. Interestingly, this goes directly against much of C.P. Snow’s contemporaneous argument for science in The Two Cultures – most of Snow’s accusations against the ‘literary academics’ are based around the fact they’re just too pig-headed to realise that science, unlike watery subjects like the arts, has made everyone’s life super great! Hey ho! Each lecturer in a technical university should possess the following abilities: (a) To see the limits of his subject matter. In his teaching to make the students aware of these limits, and to show them that beyond these limits forces come into play which are no longer entirely rational, but arise out of life and human society itself. (b) To show in every subject the way that leads beyond its own narrow confines to broader horizons. Never lose sight of the role your particular subject has within the great performance of the tragi-comedy of human life; keep in touch with life […] and, Keep life in touch with you. If you cannot – in the long run – tell everyone what you have been doing, your doing has been worthless. As a student who sat through thousands of hours of technical lectures as part of my education, with just one single hour that I remember (a second year quantum mech lecture) given over to discussing how that technical knowledge impacted on our philosophical understanding of what it is to be human in the cosmos as we know it, this part of the book is like a salve to the soul. I experience the same feelings reading Schrödinger say this stuff as I feel when reading the Sermon on the Mount. And even though I’m not religious, I think the Sermon on the Mount is pretty much one of the greatest things ever written. 2. How has quantum mechanics changed our views of the nature of matter? When you observe a particle of a certain type, say an electron, now and here, this is to be regarded in principle as an isolated event. Even if you do observe a similar particle a very short time later at a spot very near to the first, and even if you have every reason to assume a causal connection between the first and second observation, there is no true, unambiguous meaning in the assertion that it is the same particle you have observed in the two cases. […] And I beg to emphasize this and I beg you to believe it: It is not a question of our being able to ascertain the identity in some instances and not being able to do so in others. It is beyond doubt that the question of ‘sameness’, of identity, really and truly has no meaning. He likens it, by loose analogy, to a person. When we say an old friend is the ‘same’ person as when we saw them ten years ago, we don’t mean that their matter is the same (they have sloughed off skin and rebuilt organs in the meantime) but the form. Same, too, QM says about atomic particles. Young’s Double Slit experiment has shown that a single electron passing from point A to B via a double slit seems to have passed through both of them simultaneously. How? To comprehend it, we need to abandon our notions of ‘continuity’ of that particle through time and space. The form persists, but the matter does not. They are, as it were, pure shape, nothing but shape; what turns up again and again in successive observations is this shape, not an individual speck of material. By shape, he explains he means more than ‘geometrical’ shape; instead, a form of behaviour, or response to experimental conditions. That an atom excited just so will produce light of exactly these wavelengths, and so on. One still [through the 19th century] had at the back of one’s mind the thought that a true model [of the universe] exists – exists so to speak in the Platonic realm of ideas – that we approach it gradually, without perhaps ever reaching it, owing to human imperfections. This attitude has now been abandoned. He then gets a bit technical, talking about how our notion of a continuum of existence of matter through space and time needs to be revised – but how the ancient Greeks kind of saw this coming, in a sense. For the same reasons Democritus thought matter would consist of small atoms in a void – namely, all the philosophical problems that come with imagining what happens when you (say) stretch a piece of matter made of a continuous, rather than atomic, goo – Schrödinger suggests we’ll also have to rethink our notions of continuous existence of particles. To make the point, he shows an awesome mathematical proof that there are the same number of points in an infinitesimal part of the number line as there are in the whole number line (look up Cantor’s dust if you want to see the whole thing). If your rubber band is made of infinite points of matter like the number line, exactly how do you stretch it? Does a new infinity of points of matter have to be created to fill in the ‘gaps’? He then briefly touches on the whole problem of (although he never mentions cats at all) ‘does peeking at the cat change whether it’s alive or dead.’ His answer (as far as I understand it): something’s going on between the observer and the hypothetical cat, and it’s true the (again, purely hypothetical) cat is (under the strict conditions of the thought experiment) neither alive nor dead until it’s peeked at. But is there something ghostly and special about human consciousness that effects the change once it’s measured? Probably not, but it’s just a hunch. 3. Would physical indeterminacy give free will a chance? Here, in a section the length of an op-ed piece in the Guardian, the father of quantum mechanics demolishes all those arguments that have been made (and are still being made!) that indeterminacy in QM gives us free will. The arguments tend to go like this: QM shows that some parts of the universe are non-Newtonian; that is, that atoms can’t be thought of like little predictable billiard balls any more. Instead, there’s some element of randomness in the equation. Yay – no one can accuse me of just being a pre-ordained machine made of dust! I’m in charge of my own destiny and I feel great! Sorry, it doesn’t work like that. There’s some things you can’t predict as individual events on a subatomic scale (like you can’t predict whether this particular two-up coin will land heads or tails) but because there are still strict restrictions on the probabilities of each outcome (the coin, hopefully, will land heads exactly 50% of the time in the long run) so you can still guarantee how things will turn out generally. And anyway, randomness doesn’t confer free will – it confers chaos. To my mind this is the most valuable outcome of the whole controversy: the scale is turned in favour of a possible reconciliation of free will with physical determinism. I agree with him – I have no problem with thinking of myself as a machine, with stimuli coming in and actions going out, given that I’m so complex a system that no-one could ever gain complete enough knowledge of my workings to foretell what I’m going to do. And anyway, quantum mechanics shows that possibility of that perfect knowledge doesn’t even exist. To all extents and purposes, I’m unknowable and hence free. And that suits me fine. This book was mostly read in bed.